Belgium-based Fractional describes his music as “Gothic Erotica“, a dark and brooding Electronica with a strong Jungle aftertaste. Fractional literally vomits his brokenbeats and tortures them into submission, waxing them with various bleeps and crackles, smearing almost mystical pads on their bruised bodies. “A fusion of the harsh erraticism of drum’n’bass and short-circuiting IDM glitchiness with sweeping atmospheres.” (Connexion Bizarre). With previously releases on Angstprod, Goverment Thirteen, and most recently Brume Records, Fractional now joins the Tympanik Audio family with his newest album ‘Blood‘ out now. Taken from the Italian phrase for computer that literally translates to electronic brain, Cervello Elettronico is the electronic musical act founded by David Christian aka DJ Snarf. It’s sound, influenced by 80s Industrial and 90s Electronica, began in 2001. The project contributed to a new underground electronic music scene growing in the New York City area. Several demos and self released EPs were sold and openly distributed throughout the internet before Cervello Elettronico saw it’s first live performance and North American tour supporting experimental industrial bands Manufatura and Terrorfakt in 2004. This earned a small but loyal underground following in the US and the world. 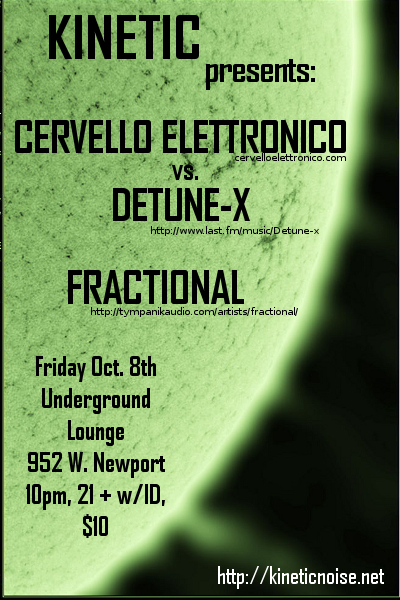 2005 brought Cervello Elettronico another North American tour supporting Terrorfakt, Ecraft, and Mono No Aware, during which all limited pressed self released tour CDRs sold out, building anticipation for an official release. Two years later, Negate The Instigator was exclusively released on Crunch Pod in the US and distributed worldwide. It was recieved with critical success and modest sales. The project’s unique blend of techno influenced industrial pushed the envelope of both genres, while garnishing club play at hard electro parties worldwide. Since then, Cervello Elettronico has performed live across the globe, supporting a variety of electronic artists such as Snog, Meat Beat Manifesto, and Combichrist. at such venues as the world famous Avalon in Los Angeles, Slimelight in London, and at the Moritzbastei in Leipzig, Germany.In 2008 David Christian relocated the experiment to Hollywood California (home to one of the strongest industrial scenes in the US) and started production on Process of Elimination, the long awaited sophmore album by Cervello Elettronico. This latest effort boasts a polished progressive sound while still maintaining a raw harsh experimental edge. At 2009’s Kinetik festival in Montreal Canada, selected material from Process of Elimination was debuted, building anticipation for the album’s worldwide release. DETUNE-X began as a solo side project of Stefano Rossello ( :BAHNTIER// ) and released in 2004 it’s debut album “Burnow!” on Rustblade. In July 2007 Stefano Rossello, in collaboration with Eric Van Wonterghem (SONAR, MONOLITH, INSEKT ) released under the name DETUNE-X the album “PUREVIL” . This new duo played live at Machinen Fest, at “Two days of Schlagstrom” and at the “Super Decadence” with Horrorist and Gitane Demone. Nowadays DETUNE-X has returned to being a solo project and on September 2009 will releases a split album with XotoX. Andreas Davids and Stefano Rossello are two of the most important figures in the new electro-industrial global panorama; composers, producers, and dj’s that for years have been hitting us over the head with their harsh audio assaults. With “We Are Deaf” they come together to construct an album of high quality and strength without compromise. Pure rhythmic noise and full-steam-ahead distorted bass drums battle together to attack us with a devastatingly powerful sonic impact, forcing our bodies into movement and testing the limits of our eardrums. Included in the album is an unexpected 10 minute jam session divided into two parts, rhythmic and then pure noise. A release aimed at alternative dance floors across the globe and rhythmic noise junkies alike… not to be missed! ~ by infomorph on September 27, 2010.